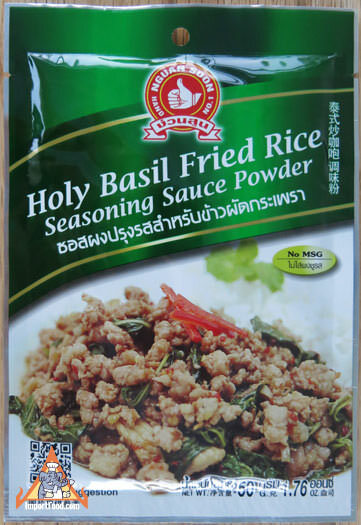 This is a nice instant holy basil seasoning powder. It's got a lovely aroma, all natural and easy to use. 1. Heat three tablespoons vegetable oil in pan. 2. Stir-fry meat (about 2/3 lb) then add 6 tablespoons water and one packet of Holy Basil Fried Rice Powder. Stir until cooked. 3. Garnish with fresh basil or vegetables as you desire. Serve with four cups of steamed jasmine rice separately or add the rice to your pan and fry it together to make fried rice. Ingredients: sugar, soy sauce powder, garlic powder, salt, dried basil leaves, pepper, chilli.